Regionalism, as Edward Mansfield describes, usually involves policy coordination through formal institutions within a region.1 Although there are conceptual debates surrounding what a region is and what regionalism is, empirically speaking one would say that there is a solid regionalism in Southeast Asia under the name of Association of Southeast Asian Nations or ASEAN. Northeast Asia, on the other hand, lacks a definite regional organization, although there are multilateral alliances that involve nations of Northeast Asia, such as Asia-Pacific Economic Cooperation (APEC). Keeping these two regions in mind, the puzzle is, why is there a solid regional multilateral organization in Southeast Asia whereas bilateral relations dominate Northeast Asia? What is the main mechanism by which a region is able to form a regional alliance and what is the main hindrance? This question could be assessed from two angles, a realist perspective or a culturalist/ constructivist perspective, which focuses on the importance of cultural norms and ideas. The realists who view the international system as a self-help system are likely to argue that the reason for the presence of a multilateral cooperation organization in Southeast Asia is that there is no severe asymmetry of power and therefore the Southeast Asian nations are less likely to perceive threat from one another. Northeast Asia, in contrast, has an element of asymmetrical power. In particular, China is rising as one of the two major global powers alongside the US, and Japan wants to maintain its status as a great power in Northeast Asia. The culturalist argument would be that Northeast Asia is historically ridden with intra-regional colonialism. That is, Japanese colonial history of Taiwan and Korea, Chinese historical influence over the Korean peninsula, and Taiwan's ambiguous status relative to China. The history of Southeast Asia, in contrast, is somewhat different in that the colonial powers in the region were extra-regional: Indonesia was colonized by the Dutch, Philippines by the Spanish, Burma, Malaya and Singapore by the English, and Indochina by the French. That is to say, from a culturalist standpoint, because the source of colonialism came from within the region in Northeast Asia, the region still maintains the hierarchal order, whereas in the case of Southeast Asia, although the same fate of colonialism had been shared, once the Western powers had left, they were geographically distant and thus no intra-regional hierarchy was present. I examine the issue of the formation of multilateralism in Southeast Asia with the abovementioned debate around the question. My argument sides with the realist perspective of power politics. As for Southeast Asia, a regional multilateral regime was able to form successfully in the region due to the existence of an external threat from outside. They were therefore able to form a regional coalition to balance against the external threat—not only from communist China but also Russia, Japan and the US. On the other hand, a multilateral regime is not able to form in Northeast Asia because the threat to the balance of power is within the region—China—which is geographically, politically and economically prominent—a prominence that has historical roots. Therefore, the countries of Northeast Asia chose to balance against the power of China with their bilateral alliance with the United States. In sum, my argument is that the crucial mechanism determining the presence, or the lack thereof, of a regional multilateral organization in Southeast Asia and Northeast Asia is the element of threat perception that formed an insider-outsider approach to political stability for Southeast Asia and in Northeast Asia formed a competitive power dynamic within the region. The first case is ASEAN, a multilateral regime that was successfully formed in Southeast Asia as a regional coalition between the countries in the region. At the time of formation in 1967, Southeast Asia was facing a turbulent political situation. A period of "Confrontation" (Konfrontasi) that went on from 1962-1966 was launched by Indonesia against the union of states of the Malay Peninsula, Singapore, and the North Borneo states of Sabah and Sarawak. Britain and the Commonwealth countries, in fear that Konfrontasi would escalate into a hot war, were forced to maintain and even increase their military presence in the region. British and other Commonwealth forces conducted a series of low-visibility penetrations of the Indonesian border of Borneo. Their purpose was to conduct preemptive, offensive combat operations against the Indonesian bases. Given these internal and external political situations, the negotiated solution to stabilize the region was the multilateral regional organization of ASEAN in 1967. In the 1967 ASEAN Declaration, one of the major reasons for forming ASEAN was that they were "determined to ensure their stability and security from external interference in any form or manifestation in order to preserve their national identities in accordance with the ideals and aspirations of their peoples." The aims and purposes of ASEAN were to promote economic growth and political stability. ARF came about through a combination of pressure from the outside powers including the US and Japan to form a forum, with their mounting concerns over North Korea, and of the threat posed by Asia-Pacific Economic Cooperation (APEC) that existed since 1990 as an alternative forum. ASEAN saw the challenge of APEC to ASEAN influence and channeled the momentum to initially launching Senior Officials Meeting on Regional Security (1992) and a year later, ARF, with the support of the US and Japan.4 Examination of the AFTA Agreement of 1992 seems to indicate that an agreement on preferential treatment had already been made in 1977, and that AFTA is a further step to the 1977 agreement. These two institutions are important for flushing out the determinants for success and failure of the multilateral regime. First, the area of security cooperation within ASEAN was based on the idea "Zone of Peace, Freedom and Neutrality. There was first the need to "mitigate latent tensions between its members left over from Konfrontasi period"; second, to bring economic development to member states, which would contribute to "political stability by helping to alleviate domestic social conditions" from communist insurgencies; last, to promote "internal security" so that ASEAN would be "less vulnerable to the machinations of outside powers.5 Although ZOPFAN as a concept did not carry itself out fully empirically, as seen in ASEAN interventions in Cambodia, Burma, and Philippines, the fact that ZOPFAN was established is significant. It shows the extent to which Southeast Asian nations feel the need to cast out foreign interference. This objective of ASEAN has three implications: firstly, it illustrates that "outside powers" constitute the main concern for ASEAN countries. This seems to make the basis for their agreement for regional cooperation. Secondly, the common standing against the foreign powers' intervention illustrates a sense of regional identity: the member states of ASEAN all realize that they are vulnerable to such intervention, which fosters a sense of commonality between them. Lastly, it illustrates one of the defining characteristics of ASEAN: the doctrine of noninterference. Second security cooperation of ASEAN was ASEAN Regional Forum (ARF), the only region-wide security forum of the Asia-Pacific, now comprising 25 states including China, Japan and the US.11 ARF is considered by various scholars like Yuzawa12, as unsuccessful in bringing about security cooperation in AsiaPacific area. The main intention of formation of ARF is to play a role in Preventive Diplomacy and the inefficiency arising from the debates amongst ARF members around the topic of Preventive Diplomacy: the concept and principles of Preventive Diplomacy, specific measures of Preventive Diplomacy, and structural reform of the ARF. These areas are addressed by Yuzawa's paper on evolution of preventive diplomacy in ARF. The debate concerning the limitation of multilateralism of ARF shows that there are conflicting views between the countries with greater power and those with relatively less power in the multilateral Forum. It could be argued that the great powers in the Forum—the US, Japan, Canada and Australia—advocated for expansion of scope to interstate and domestic issues because they considered ARF as a method through which they could expand their control over the region of Asia. Considering that Western powers were the main supporters of the Activist view also emphasizes this point, which could be summed up as divergent interests of individual states in defining their own regional interests.16 More importantly, the fact that the stronger states were balanced by the weaker states of ASEAN in the issue of coverage expansion is important: although the result was ineffectiveness of ARF, ASEAN countries plus China served to counteract threat to balance of power, which suggests realism prevails in multilateral agreement as countries with substantial power disparities have come into the coalition. The debate between the activist countries and the reluctant countries is continued to the topic of measures of ARF, namely Structural Reform. 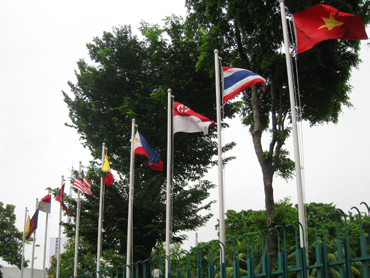 The Non-ASEAN nations complained that ARF agendas were limited, due to ASEAN's central role in the Forum, to Southeast Asian issues and "legitimized the Asian Way of institution-building into the operational rules of the ARF".17 ASEAN Way, as the activist countries believed, were not suitable in promoting practical security cooperation in the ARF, therefore structural reform of the ARF was needed: firstly, to minimize the degree of institutionalization around ASEAN and secondly to share the ARF chairmanship with non-ASEAN members in order to expand the scope of agenda to nonASEAN regions. The response of ASEAN countries, however, was the rejection of such structural reform. ASEAN was ‘neither ready to relinquish its leadership role' nor did it want to ‘support further institutionalization of the forum." This rejection of the proposal for structural adjustment and continuation of ASEAN's leadership role was ardently supported by China, for China saw this as a ‘counterweigh to U.S. and Japanese influence over the forum".18 Important to note here is that China saw ASEAN's leadership as a balancing tool to US and Japan: power struggle, despite the nature of multilateral cooperation, was prevalent in ARF that led to its inability to reach a consensus on any major issues. From these two debates, it can be concluded that for a multilateral coalition to be successful, the countries need to be in similar standing in terms of power so that there would not be the incentive to use the security coalition to pursue the country's power expansion. It is also important to note that involvement of multiple great powers in a multilateral coalition results in extreme inefficiency and inability to reach any consensus. ASEAN itself had an incentive to cooperate because of the member countries' status as weak states in an inhospitable environment but ARF had many powerful states and the members were not unified the perception of common external threat19, therefore another crucial element in forming a multilateral security cooperation is a common threat that is recognized by all member countries so that they agree to form a security coalition to balance that threat. ASEAN entered a new stage of cooperation when AFTA was established in 1992 with the aim of increasing the cooperative power of ASEAN. Choi explains that AFTA was intended especially as a safety tool to prepare for uncertainty in world economy following Uruguay Round and to follow the global trend of formations of trade blocs in world economy such as North America Free Trade Agreement (NAFTA) and European Economic Area (EEA).20 Bowles explains that there are three factors in explaining ASEAN formation of AFTA: firstly, changes in the international political economy; secondly, change in internal power dynamics/ structures within ASEAN, and lastly ASEAN identity. Although Bowles argues that there are three explanations for AFTA's formation, I argue that this can be boiled down under the third reason (ASEAN identity), for if it weren't for ASEAN's regional identity, the countries could have joined the Asia Pacific Economic Cooperation (APEC) which involved countries that were more economically developed than the members of ASEAN and thus would have aided their economic development. From considering the two areas of the Association's achievements, namely regional security cooperation and free trade agreement (economic cooperation), ASEAN seems to be a good model that fits Katzenstein's list of conditions that lead to successful multilateralism.27 In terms of great power status, there was one great power (Indonesia) that could serve as the center of cooperation, there was a common perception of threat due to the member states' relative weakness to the rest of the world, and lastly there was regional solidarity based on this perception of threat thereby allowing economic cooperation. What needs to be taken into account, however, is that the ARF was largely unsuccessful and is considered ineffective because even though it was initiated by ASEAN, it was firstly and foremost not regional: it involved Asia, Oceania, North America and Europe which led most importantly to lack of regional identity and lack of common threat that would serve as the basis for cooperation. Also important is the presence of competing power structure in ARF: Realist point of view on balance of power and security dilemma prevails to hinder cooperation. Acharya, A. (2004). How Ideas Spread: Whose Norms Matter? Norm Localization and Institutional Change in Asian Regionalism. International Organization , 58 (2), 238-275. Bowles, P. (1997). ASEAN, AFTA and the New Regionalism. Pacific Affairs , 70 (2), 219-233. Area. Review of International Political Economy , 3 (2), 319-348. Choi, D.-S. (1997). ASEAN Strategies for Regional Cooperation. Research Institute of National Unification , 243-276. Choi, K. (2004). Direction for the Future of Korea-US Alliance. In S.-C. Lee, 21st Century Northeast International Relations and Korea (pp. 297-326). Seoul: Nanam. Gilpin, R. (2002). The RIse of American Hegemony. In K. O’Brien, Two Hegemonies: Britain 1846-1914 and the US 1941-2001 (pp. 165-182). Aldershot: Ashgate Publishing, Ltd. Kang, D. (2003). Getting Asia Wrong: The Need for New Analytical Frameworks. International Security , 27 (4), 57-85. Katzenstein, P. (2002). Why Is There No NATO in Asia? Collective Identity, Regionalism, and the Origins of Multilateralism. International Organization (56), 3. Kim, S.-C. (2004). Japan’s Diplomatic Security Strategies. In S.-C. Lee, 21st Northeast Asian International Relations and Korea (pp. 133-170). Seoul: Nanam. Lee, G.-D. (2004). North Korea’s Diplomatic Security Strategies. In S.-C. Lee, 21st Northeast Asian International Relations and Korea (pp. 259-294). Seoul: Nanam. Narine, S. (1997). ASEAN and the ARF: The Limits of the “ASEAN Way.” Asian Survey , 37 (10), 961-978. Narine, S. (1998). ASEAN and the Management of Regional Security. Pacific Affairs , 71 (2), 195-214. Organski, A. (1989). The Power Transition: A Retrospective and Prospective Evaluation. In M. Midlarsky, Handbook of War Studies (pp. 171-194). Boston: Unwin Hyman. Park, C.-G. (2010). Prospects for Changes in US-China Relations and Korea’s Strategy for Security Cooperation (Vol. 26). Seoul: Korean Institute for Defense Analysis. Park, E.-H. (2006). ASEAN Way and the Changing Role of Southeast Aisan NICs: The Controntational Co-Existence of Soveriegnty, Development and Human Rights and its Evolution. Southeast Asia Research , 16 (1), 119-147. Peth, S. (1999). ASEAN and Regional Security. Economic and Political Weekly , 34 (33), 2304. Yang, S.-Y. (2001). The Future of Regional Cooperation in Asia: ASEAN’s Policy Toward ASEM. East Asian Review , 13 (4), 79-92. Yuzawa, T. (2006). The Evolution of Preventive Diplomacy in the ASEAN Regional Forum: Problems and Prospects. Asian Survey , 46 (5), 785-804. Yuzawa has done extensive research on ASEAN, especially ASEAN Regional Forum and its role in Asian security dynamic. One of the few major English sources on ASEAN. See Rozman, Gilbert. The East Asian Region: Confucian Heritage and Its Modern Adaptation (ed., Princeton University Press, 1991). See Acharya, A. (2004). How Ideas Spread: Whose Norms Matter? Norm Localization and Institutional Change in Asian Regionalism. International Organization , 58 (2), 238-275. Peter Katzenstein offers criteria for successful multilateralism. The three factors in the criteria are as follow: first, presence of a great power in the region; second, presence of threats; and third, regional identity (Katzenstein 2002). China’s interests in North Korea are well-established in the literature; See Nanto, D. “China-North Korea Relations.” CRS Report for Congress (2010). Pi, Yong-ik. (March 15, 2013). First Button for Korea-China-Japan FTA to be put on this month. Edaily News. Retrieved from http://edaily.com (in Korean). Ministry of Foreign Affairs, Japan. Diplomatic Bluebook. 2010. Korea Times. (June 22, 2012). Fackler, Martin. (November 26, 2012). Japan Expands its Regional Military Role. New York Times. Xiaokun, Lin. (April 8, 2013). China-Africa Coordination at strongest. China Daily. Shengxia, Song. (March 27, 2013). China, Japan and S. Korea begin FTA talks. Global Times. Bajoria, J. “The Six-Party Talks on North Korea’s Nuclear Program.” Council on Foreign Relations Backgrounder. (Updated: March 2013). See Zhongying, Pang. “The Six-Party Process, Regional Security Mechanisms, and China-US Cooperation: Toward a Regional Security Mechanism for a New Northeast Asia?” Brookings Institution (March 2009).